Symphony No. 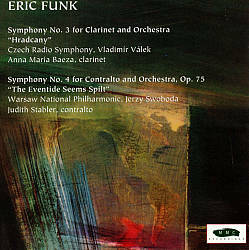 3 for Clarinet and Orchestra, "Hradcany"
Symphony No. 4 for Contralto and Orchestra, Op. 75 "This Eventide Seems Spilt"
Angela; ACT II, scene 13 “Is this goodbye to love?" String quartet No. 2, "In Memoriam Shostakovich"